Why? Because such affirmations of our shared lived experiences cost so little yet can mean a lot. Taking several flights just before Christmas reminded me how tiring December air travel can be—but also how easy acts of kindness can generate counter-narrative responses to the frustrations we often encounter during such journeys these days. I’m writing about what my longtime academic colleague Beth Daniell has called “little narratives” because the dominant narrative on travel these days can send us into depression ahead of our actual trip. And, on a related note, sometimes the contrast between typical holiday travel reportage and our actual experiences can be better understood as incomplete story-telling rather than maliciously inaccurate representation. So, reminiscent, on an everyday level, of the feminist movement that has worked for decades to bring marginalized stories of daily life into circulation, let me offer up some nuggets from our family’s recent airline trips. Here’s one example. 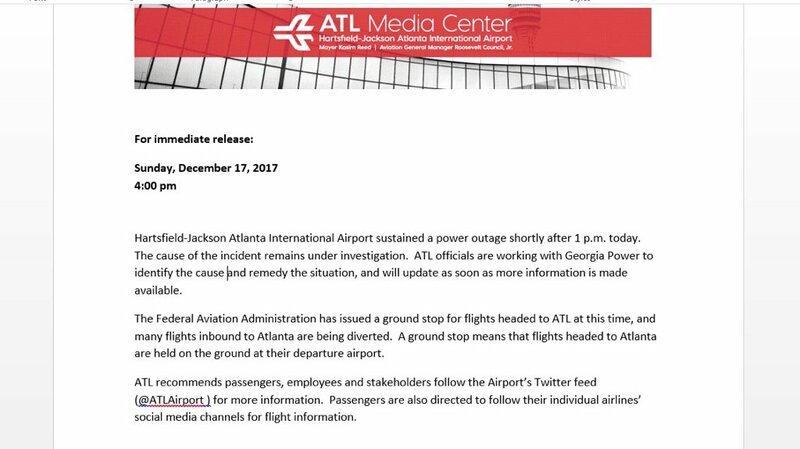 I was one of the thousands of travelers stranded in Atlanta on Sunday, December 17, when a fire knocked out both the basic and the back-up power systems for the world’s busiest airport. There was plenty of inconvenience to go around—but for some of us, at least, things could have been much worse. Admittedly, I interacted directly with only a small percentage of those trapped in ATL’s 11-hour power loss that Sunday. But as others who were there have written, it seemed that most people (passengers and employees alike) were patient, good-humored, and kind to each other. Folks shared whatever news they could glean (usually from calling friends or family outside the airport, since there was little information available in the terminal, and the airport’s twitter feed generally failed to provide meaningful updates). Updated information on the ATL power outage. Fellow passengers and staff offered up advice on how to navigate the situation—with local knowledge-sharing being especially helpful to those unfamiliar with the idiosyncratic features of Hartsfield-Jackson, such as where to find the in-airport MARTA transit system (thankfully still running). Kidding around was far more prevalent than grousing, and the jokes helped diffuse the stress (both around the airport and on social media). My husband and I were about to check our bags at the American airlines ticket counter when the airport went dark. Having our bags still with us would turn out to be a blessing. Some passengers whose luggage had been checked had to wait more than a day for their bags to turn up. Having our luggage was one factor encouraging us to leave the airport earlier than most and to claim a nearby hotel room. Staff members at the Marriott Gateway were unfailingly upbeat, even though the entire hotel—including the lobby restaurant—was jammed with many more guests than on a typical Sunday. A cashier in the tiny hotel shop helped luggage-less customers find stopgap toiletries. Every elevator ride and lobby conversation I had that night included friendly banter about the darkened airport—with several people noting that our “plight” was hardly comparable to fellow Americans in Puerto Rico, many of whom could still be without power months from now. One young man reminded us that being able to travel at holiday time was, in itself, a sign of great economic privilege. DFW was crowded, And we suddenly discovered that American had swapped out our particular aircraft for a larger one—my guess would be to accommodate many hopeful travelers aiming to reach their own holiday destination after disrupted itineraries. The shift in equipment did lead to lots of computer-made seat changes, separating families in some cases. But people took the changes in stride, as passengers swapped seats to help reunite family members. Folks also helped each other lift the seemingly endless stream of suitcases into overhead bins, adjusting placements to accommodate everyone’s items. One flight attendant stoked such efforts at good will by wearing a huge elfin hat and greeting our compliments on her wardrobe with jovial laughs. A restless, whining baby elicited good wishes for the parents rather than complaints. What’s the significance of these brief moments of camaraderie in a time when so many dark stories permeate our communications networks? Perhaps only to highlight how little gestures of affiliation in sites of public interaction do make a difference. We are, after all, traveling along together through multiple domains of interpersonal engagement. Maybe just being kind to each other in little ways will encourage our leaders and our institutions to aim for a similar commitment in their work in the upcoming New Year. For 2018, let’s try for simple kindness on all our journeys.